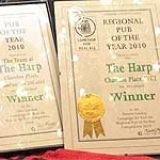 The Harp is an award-winning real ale pub, serving dozens of ales and craft ciders at any one time to an appreciative audience. 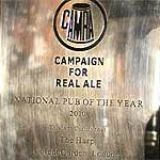 The Harp has previously been awarded Camra's Pub of the Year award. Do you work at Harp? What did you think of Harp? A nice little pub (and little is the word!) with a good selection of ales and beers. Extremely central, it feels like a haven in such a central spot. Don't expect to get a seat, and the toilets are truly tiny, but a pleasant pub to have a beer, especially on a summers evening. With all of the excellent pubs throughout London, this is one of the few gems to visit many times over on your trip to London without feeling you're missing out some other potentially great pub. Owner and manager, Binnie Walsh knows her cask ales and was willing (enthusiastic) to explain her excellent offerings, although she was a bit shy about having her picture taken. Eight handpumps serve a delicious range of cask-conditioned ales. The Sambrook’s Wandle, Twickenham Original and The Dark Star Winter Meltdown were all perfectly conditioned! Sadly, it was early in the day and my wife had a schedule for us to keep. Just as well. A person can’t just sit drinking cask beer in a pub all day, can they? Anyway, the rest of the day seemed to float merrily along. Thanks for your concern! Harp has a narrow, yet comfortable bar area downstairs with leather seating and a wide shelf to rest your ale and food upon. A mix of framed paintings from days gone by, line the walls on both floors. Stained glass windows and etched mirrors lend the illusion of a larger space. Up the round staircase is a small, but well-spaced lounge area with an eclectic mix of comfortable antique chairs, sofas and tables. The walls are painted in muted shades of reds and pinks. Try to land the window seats if possible. The Men’s room is oddly placed half-way up the stairs. Fortunately the door opens inward. Unfortunately, you may find yourself waving hello to passerby’s with your free hand. A friendly wink and nod will do if your free hand happens to be clutching your pint glass. This pub deservedly gathers its share of CAMRA and Cask Marque awards and gets very high marks from many local London Guides. The Harp is a true London treasure! A really good, proper pub. Excellent range of well kept real ale, friendly staff, great sausage sandwiches - an absolute diamond that should be held up as the blueprint for how to keep the best traditions of British pub keeping alive. Superb pub. Friendly, vibrant and with a range of excellent beers. SPBW London opub of the year 2008 -Well deserved. Proper pub,no tv etc,perfect real ale and plenty of it for a good price.Friendly too. Victorian visionary and poet Francis Thompson saw “the traffic of Jacob’s ladder pitched betwixt Heaven and Charing Cross.” Now Charing Cross has an ale heaven in the Harp of Chandos Place, with exceptionally high customer traffic. Notably it was the capital’s first ever pub in 23 years to be crowned as the Campaign For Real Ale’s (CAMRA) National Pub of the Year in 2011. 130,000 dedicated drinkers can’t be wrong! 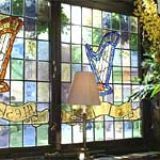 The Harp is quietly located away from the noisy hustle of Leicester Square - a handsome Victorian building with an etched glass frontage decorated with Welsh harps that recall its early life as the Welsh Harp pub once owned by the Charrington Brewery of Mile End. The front door is festooned with stickers and badges proclaiming its multitudinous awards for excellence. Interestingly, it’s close to the site of the once-celebrated Golden Cross Inn mentioned in several Dickens works as “the busiest coaching inn of the West End,” and the Harp is thriving, too. So thriving that, at peak times, customers have to cheerfully spill out into the passageway of Brydges Place at its rear. The much-mirrored main bar downstairs has a dark wood and cream wallpaper interior with a jumble of stools and wall settles and a single wooden bar. An abundance of portrait prints and photographs add interest – try to spot the celebrity, as many pictures are of stars that once illuminated the West End theatre and cinema. 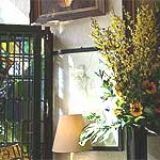 Reached by a narrow wooden staircase, the upstairs room is like an old-fashioned saloon with red carpet, leather armchairs and elegant oval tables. The Harp is firstly a pilgrimage for Real Ale devotees. 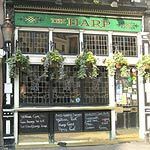 Many visitors, British and foreign, schedule a trip to the Harp as an essential part of the London experience. Recent years have seen an overseas explosion because of the surge in growth of top-fermented beer production and appreciation in so many countries. North American aficionados of craft beer, French fans of biere a refermentation haute, Italians inspired by birra artiginale; all can be found in the Harp savouring British ales and making comparisons with their own national products. Many other groups are evident. The Harp is popular with people working in West End and Whitehall offices and shops and it is especially favoured by artists and staff of the several nearby theatres. Prominent are those from the adjoining London Coliseum’s English National Opera. Expect to hear snatches of Mozart or Verdi being hummed and discussed. All groups mingle amiably and conversation is constant as there’s no jukebox, piped music or TV. The Harp is renowned for its simple but admired fare of sausages in crispy baguettes. The choice varies from day to day but, being cooked on a grill, succulent smells waft around the downstairs bar of such offerings as steak and kidney, beef, Guinness and horseradish or traditional pork. There can even be aromas of the exotic, such as Moroccan lamb or spicy Toulouse. Priced at only £2.50, they are a West End bargain. The Harp has been managed for twenty years by the passionately pro-Real Ale Binnie Walsh. This legendary Irish landlady has been so successful that she was able to buy the pub outright a few years ago. She has earned Cask Marque accreditation and repeated listings of the Harp in the Good Beer Guide. Earning the 2011 National Pub of the Year title in 2011 came a year after Greater London CAMRA honoured her with the annual John Young Memorial Award for outstanding services to Real Ale and Pubs in the capital. Eight handpumps serve a rotating selection of ales so interesting that many a customer comes to discover what’s on offer each day. Regulars often include Battersea’s Sambrook’s Wandle and Junction and a variety of ales from Sussex Brewers, Harvey’s of Lewes and Dark Star of Horsham. Others can be from Hardknott or FFF and there’s always a dark beer – mild, porter or stout. Demand is so consistently high that the ales sell quickly and are consequently always of fresh, top quality. Among the bottle-conditioned beers is a selection from exciting Southwark microbrewery Kernel, which specialises in powerful malt-laden products. There are only two lagers on tap but even they are exceptional – the Czech Staropramen and the American-made, Austrian-style, bottom-fermented dunkel, Black Squirrel black lager. The Harp, in addition, was chosen by CAMRA as the London Cider Pub of the Year in 2011. It usually has seven artisan ciders available in tubs. The suppliers often include Brooke Farm of Herefordshire and Hartlands of Gloucestershire and an eclectic choice from such known producers as W.M Watkin of Gwent. There’s usually a perry from a producer such as Hecks in Somerset. These products have a superior quality - they are made from fresh fruit juice and are fermented only from natural yeast on skins and in the flesh. There’s the usual range of spirits and liqueurs and the wine list is small but well-chosen and appealing. Among the five whites is a Viura-based white Rioja and the reds include a red Rioja and a beefy Aussie Shiraz. The Harp has become a venue as integral to London life as the neighbouring London Coliseum, National Gallery and National Portrait Gallery. Its fame rests upon real ale, real cider and real conversation. Francis Thompson had spiritual concerns but, an ale- drinker himself, he would have appreciated an earthly heaven at Charing Cross.